My name is Taniya Khan, sister of Marc Faisal Khan. 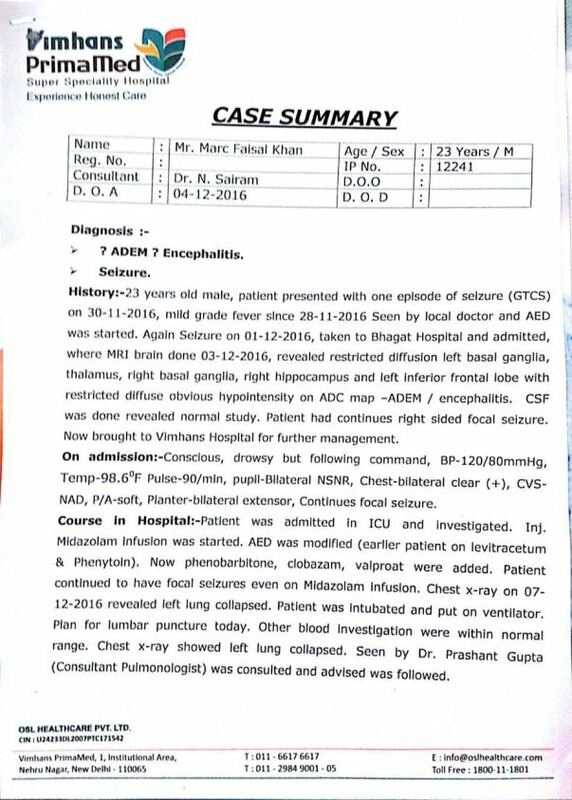 Marc Faisal Khan, 23 yrs old staying at flat no 800, Sarvahit Apt, Sec 17 Pkt A, Dwarka 110075 has been diagnosed with ADEM which is a brain infection. 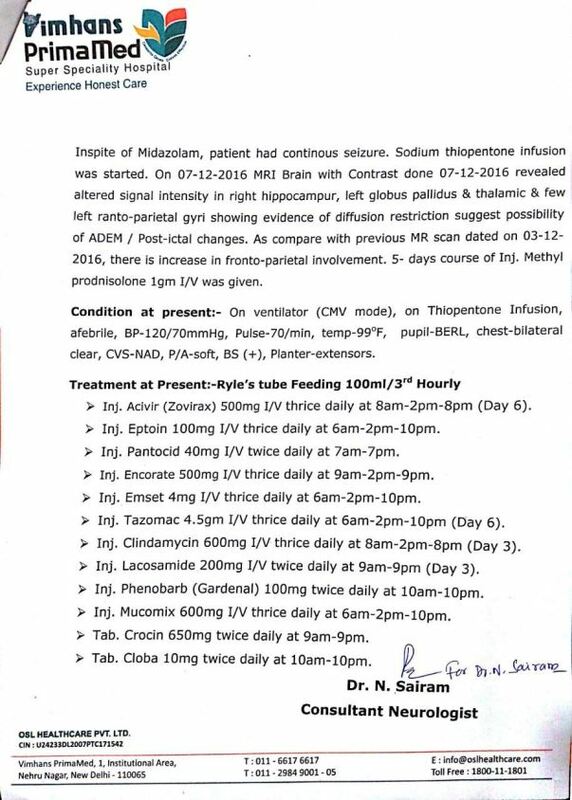 He has been admitted in VIMHANS and is undergoing treatment.The disease causes focal seizures which the doctors have been unable to stop as of now. 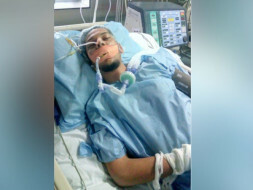 Since he has been admitted for 9 days now his one lung has collapsed and he is on the ventilator.The billing at the hospital is approx 60000 a day . We are a family of 4 people, I am the only earning member of my family. I have been told by the doctors that seeing Marc's condition, he will be in ICU for almost next 2-3 months. I have exhausted all my savings and don't have any more money to continue the treatment. Doctors advised me to shift my brother to AIIMS hospital. As according the them, it is the only hospital which can match up to the current treatment. But shifting to AIIMS hospital is getting difficult as the doctors at AIIMS are not ready to help me. I don't have any other option left but to keep him at Vimahns only. Please help in keeping my brother alive. Any amount you donate will make a difference.Looking forward for your support. Our hearts go out to this fighter who endured so much pain and fought so hard for his life. Your timely support ensured that he received the best medical care. Taniya is grateful for all the care and support that you have shown to her brother. We hope they find the strength to cope up with this loss. Please keep the family in your prayers. We need continous prayers.. Marc has still not responded. 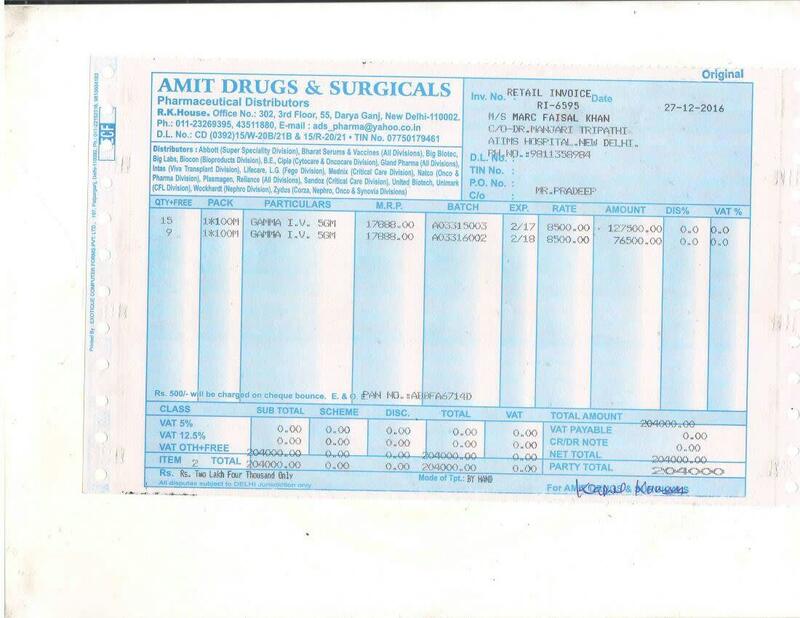 He has been given IVIG treatment as well which costs somewhere around 2 lacs. We might need to give him this treatment again. Looking forward for your support and wishes. I am truly overwhelmed with all the support I am receiving. I thank you all for your kindness and amazing support. Here is an update on Marc: My brother is now admitted in AIIMS and they are starting with a treatment called IVIG which costs approximately Rs. 2,00,000. Looking forward to support and prayers, and thank you once again !